Doctor Who: Big Finish - THE ENTROPY PLAGUE Review | Warped Factor - Words in the Key of Geek. It’s later than you think, says Tony Fyler. Let’s say this: The Entropy Plague is about exactly what it sounds like it’s about: entropy, the central force that distinguishes E-Space stories from most N-Space stories, both affecting everything in its normal, if here accelerated, fashion, and also transferred as a plague in a game of ‘Fall-Apart Touch’. The main monsters aren’t really monsters, any more than the Mummy in Mummy On The Orient Express was, and indeed, they bear a striking audio resemblance to that dangly-bandaged unfortunate, inasmuch as you really don’t want to let ‘The Sandmen’ touch you. Think plague-infected zombies and you’re most of the way there. So far, so not that original, to be fair. On the planet Apollyon, people from all over E-Space are gathering for a New Orleans, Day of the Dead-style party while the last of their universe burns or turns to dust. Of course, there are the plague-zombies, but hey, we’re all about to die anyway, so they never really achieve much in the way of scares. They’re just an additional irritant on the day the universe ends. Meanwhile, a man named Pallister, played with haughty implacability by Robert Duncan (Gus from Drop The Dead Donkey) seems to have a plan – even, perhaps a way out of the desolation of the universe. He’s found the last remaining CVE in E-Space on Apollyon, and he has a way of keeping it open long enough to get a refugee ship out. Hooray for Pallister, saviour of the universe! Except the way he has is gruesome in the extreme, and it frames the moral dilemma at the heart of the story: greater love hath no man than he should lay down his life for his friends, sure – but who do you choose to be the man doing the laying down? Of course, this is where the whole Sydney Carton thing comes in – and it divides the Tardis crew right down the middle, with the Doctor’s god complex making him almost eager to step into the breach and be stranded forever in the pocket universe, and Nyssa – good girl, always-helpful, self-sacrificing Nyssa, almost challenging him to an arm-wrestle for the honour of being thrown into the steampunk piece of kit that can not only get a ship out of E-Space but also stabilize the universe for a few hundred years, rather than the few hundred minutes it seems to have left. It would of course render listening to the story entirely pointless to tell you if either of them succeeds in their tug-o’-self-sacrifice or whether another, MacGuffiny solution is found, but the differing views of the two ‘good’ characters and the two more realistic ones, Tegan and Turlough, is deliciously comic to listen to. In particular, all credit to Mark Strickson for delivering Turlough’s arch-rationalist lines in this story like the only sane person in a suicide squad. In fact, for those who never really appreciated Turlough on screen, this story has enough from him to make the almost unthinkable happen – you might start to like him. Just a bit. Maybe. If you’re any kind of Nyssa fan, you’re absolutely going to have to listen to this one too, as it’s as close as either the TV show or Big Finish have ever coming to delivering a personality profile of her character. As a final act for the new E-Space trilogy there’s a certain inevitable slightness to the storytelling – the main dilemma is revealed fairly quickly, and the moral maze rather dissipates when you have a boatload of volunteers to put their neck in the entropy noose. The entropy plague itself is pretty much an irrelevance, except inasmuch as it highlights the state of the universe we’re dealing with, and the single line that ties this story back to, of all the tales that never needed a sequel, Warrior’s Gate, is all very well but never gets a second reference to build it into something. Writer Jonathan Morris delivers probably the most outright E-Space-flavoured of the three new E-Space stories, to the extent that the pocket universe stories had a tendency to harp on a small handful of themes. But there’s little of the leap forward in understanding of Mistfall here, nor the shocking punch-points of Equilibrium – though the idea of volunteering for execution carries over from the second story into this third. That said, The Entropy Plague’s big spoilerific story element means it’s one that you’ll almost have to listen to if anything going forward with the Fifth Doctor’s Tardis is going to make any sort of sense, and it does deliver a viable return to N-Space plotline, so on at least two of its crucial levels, as well as in terms of characterization for Tegan, Turlough and Nyssa, it delivers its goods. 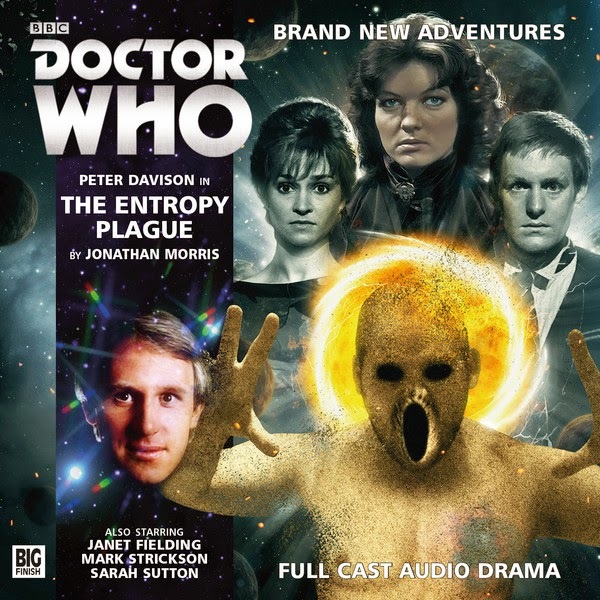 So while having paid full price for The Entropy Plague feels like a little bit of a swizz, it’s undoubtedly one to listen to before you pay out for any future Fifth Doctor releases. Will you go back to The Entropy Plague for a second listen any time soon? No, probably not. But you really will have difficulty going forward until you get this one under your belt.